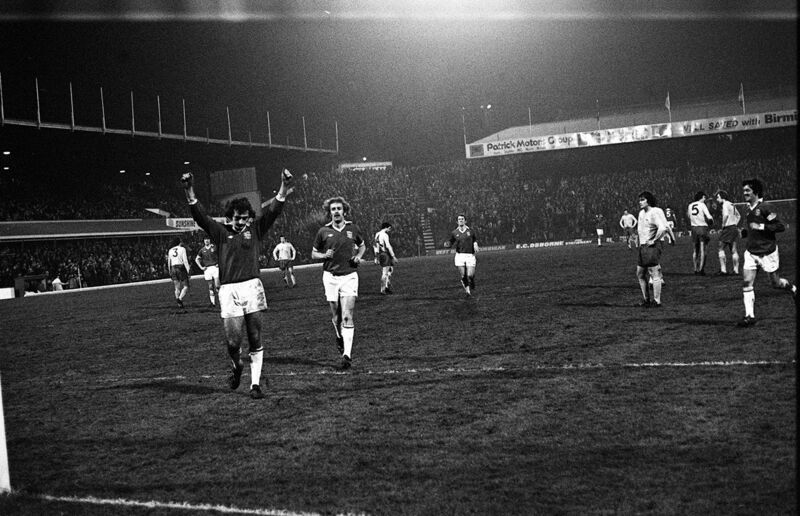 Today is Trevor Francis Day #TFday; a celebration of one of Birmingham City’s favourites who became the game’s first million pound player when he was sold to their opponents today, Nottingham Forest. My love for Blues started early, had my dad had his way, I would have been named Trevina Francesca in honour of the hat trick he scored on the day I was born! Times have moved on a bit since then, Chelsea spent more than £16million on agents fees last year. This season social media is more important than ever for football clubs to engage with their fans. Birmingham City may not be able to match the all singing all dancing second screen TV match day app of Manchester City. But their understanding of great social media means they have top flight accounts. They get the balance of content, tone, and integration into their overall communications. The figures are impressive 200 000 Facebook likes and 80000 Twitter followers but more importantly they way they use the channels, their interaction with fans, and their approach are key. So what can we learn from how they do it? Different channels work better for different things, BCFC’s Facebook page is a place for fans to chat to each other, feedback to the club, share tips on away grounds, and something all fans love reminisce about the good old days! The club does post updates on match days but thanks to Facebook’s newsfeed not appearing in time order, it doesn’t always make sense, by Saturday night it can be that a popular pre-match post will appear above one with the final score on! Twitter works perfectly for match updates and the club do minute by minute updates so fans around the world can follow the action in real time. The club are very adept at using hashtags, regular ones include #bcfc, #keeprighton (the club’s song), #bcfclive and #bcfcawaydays. They also create them for special events, for example the new manager Gary Rowett #rowettreturns, and with success; #TFday has reached 3/4 million accounts at the time of writing. They use hashtags already popular on Twitter to increase their reach; #throwbackThursday and #FlashbackFriday are perfect for reviving memories of past glories. The club also took part in #bidtoremember. Many of the players have Twitter accounts, the club retweet their post match thoughts as they tweet them, giving fans a chance to interact directly with their heroes. Several staff at the club have accounts too including the head of retail @wayen_cowen, allowing the club to promote special offers, @BCFCticketlady who provides social media customer service, and until recently @_andywalker_ who has been responsible for much of the club’s social media success. He has now moved on to the FA. These personal touches really help fans to feel involved in their club and connected to what is going on. Like all football clubs, Birmingham City are lucky to have great content for their youtube channel particularly player interviews and match highlights. They package them really nicely and promote them via Facebook and Twitter. The club aren’t afraid to use the same content in different places where appropriate. 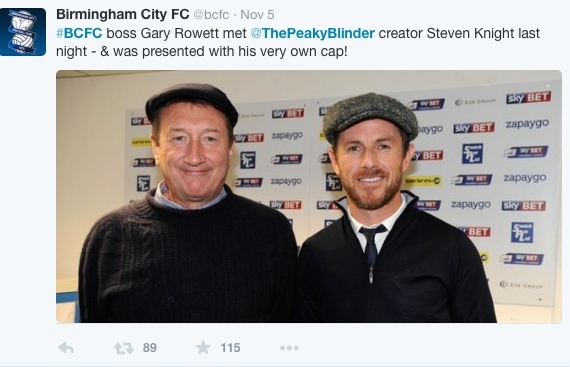 This very popular photo of manager Gary Rowett with Peaky Blinders writer Steve Knight was both tweeted and used in the programme. Tweets are used to create an article in each programme. The club also do a weekly news story on their website of the top 5 most popular social media posts on each channel. As I found working at the Environment Agency, when there are issues and they receive a lot of negative press coverage, the reaction on social media is usually less negative and more supportive. Even after an 8-0 drubbing fans bounced back and really rallied round as rumours grew that Gary Rowett was to be the new manager. Last year Birmingham City came top of the Championship teams in the Sport Social Media Index. If only they could have a few league points for the quality of their social media!